This document was originally made available in the form of a series of image files by the Open Rights Group. It was obtained by James Firth. We have processed the images into PDF format to enable easier viewing and distribution of the document. 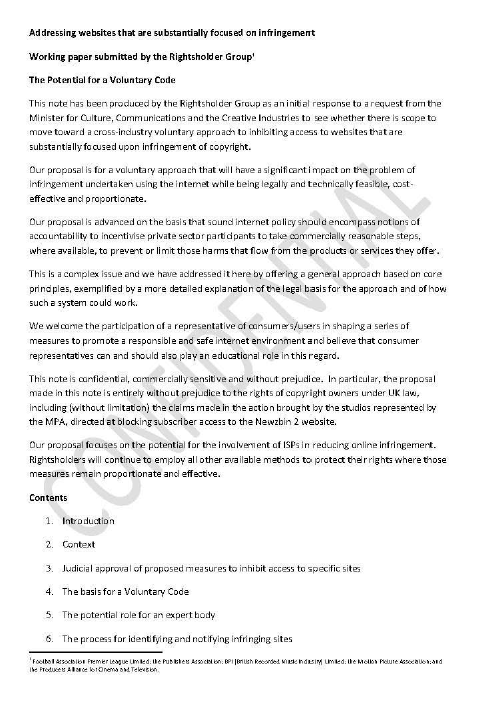 This note has been produced by the Rightsholder Group as an initial response to a request from the Minister for Culture, Communications and the Creative Industries to see whether there is scope to move toward across-industry voluntary approach to inhibiting access to websites that are substantially focused upon infringement of copyright. Our proposal is for a voluntary approach that will have a significant impact on the problem of infringement undertaken using the internet while being legally and technically feasible, cost-effective and proportionate. Our proposal is advanced on the basis that sound internet policy should encompass notions of accountability to incentivise private sector participants to take commercially reasonable steps, where available, to prevent or limit those harms that flow from the products or services they offer. This is a complex issue and we have addressed it here by offering a general approach based on core principles, exemplified by a more detailed explanation of the legal basis for the approach and of how such a system could work. We welcome the participation of a representative or consumers/users in shaping a series or measures to promote a responsible and safe internet environment and believe that consumer representatives can and should also play an educational role In this regard. This note is confidential, commercially sensitive and without prejudice. In particular, the proposal made in this note is entirely without prejudice to the rights of copyright owners under UK law, including (without limitation) the claims made in the action brought by the studios represented by the MPA, directed at blocking subscriber access to the Newzbin 2 website. Our proposal focuses on the potential for the Involvement of ISPs in reducing online infringement. Rightsholders will continue to employ all other available methods to protect their rights where those measures remain proportionate and effective. The request from the Minister is to establish whether there is a practical, balanced and fair means of addressing the problem of websites that are substantially focused on infringement. These will be sites, mainly hosted overseas, which make available, facilitate the making available of, or otherwise authorise the infringement of copyright content in the UK. This request follows acceptance that cease and desist procedures are often ineffective in the online environment where there is structural infringement taking place on the site and the operators of such sites can be hard to identify, unlikely to respect legal process in this area (or even to provide accurate data to service providers) are highly mobile, and/or operate from territories with weak IP provisions or weak enforcement. In the online environment, the actions of intermediaries — notably ISPs and search engines — are crucial to achieving the effective prevention of infringement. The objective is to establish a system that protects a copyright owner’s property rights by substantially inhibiting infringement while protecting the legitimate interests of consumers, site operators and service providers, including (where relevant) access to services and information and freedom of expression. Our proposed system (“the Proposed Voluntary Scheme“) is capable of being proportionate in operation and cost-effective and is also able to support action that is timely given the speed with which real damage can be Inflicted on rights owners. The Proposed Voluntary Scheme is based on, and works within, the parameters of existing law, notably Section 97A of the Copyright, Designs and Patents Act 1988 (S97A, CDPA) and Sections 17 and 18 of the Digital Economy Act 2010 (S17/18 DEA). A voluntary self-regulatory solution – if fully effective – could largely supplant the need for S17/18 DEA, which should nevertheless be implemented to be available if S97A, CDPA is not held by a Court to be an adequate provision for these purposes and to be available if the Proposed Voluntary Scheme ceased to operate for any reason or the Scheme did not apply to certain types of site. It would be the responsibility of rightsholders to identify sites that potentially meet the criteria and to gather the appropriate evidence. This evidence should be sufficient to reasonably identify that a website is indeed substantially focused on infringement. It is not Intended that relatively small amounts of infringing material Inadvertently offered by a website should be sufficient to trigger blocking of a site. We would therefore propose an objective assessment be undertaken, by or at the direction of the expert body, of apparently infringing sites to examine whether a focus on infringement is a substantial part of the websites operation or whether the site causes substantial commercial harm. Guidance can be taken from relevant UK, EU and international case law. Identified sites should have a proper opportunity to correct the infringements concerned or refute the allegations. The process of prior notification (where possible) by the rightsholder would be an important part of the Code.